Please Note: All help given to Pastor Dave, was per his personal request to me. He was facing charges of disorderly conduct and resisting arrest. Before my work they had offered to drop the resisting, only; after they dropped the disorderly conduct and changed the resisting arrest to obstructing an officer. Jesus says that what we do for one of His, we do for Him. Yes, we can help each other in this life and should. It was the Thursday before the music event and Pastor Dave was giving Nathaniel Partee, 47, a ride to a scheduled appointment at a detox center, a place that would help Nathaniel stay off of his addiction. A short distance on route, he stopped at a Burger King to get something to eat for the both of them. He went through the drive-through. While waiting for their fish sandwiches in a parking space close to the building, Pastor Dave saw two teen boys skating in the parking lot. Thinking about the event that was just a little over a day away, Pastor Dave called out the window, "Hey kids, come here." He wanted to tell them about Jesus and invite them to the event. The boys, one thirteen-and-a-half, the other turning fourteen that month, did not go over to the truck. They instead called the police. A police report shows that officers were dispatched on a call for a white man and black man trying to coerce two juvenile males into a truck. The Gazette, a local paper, reported one of the teens as having said, "I was not going to go up to the truck. We were thinking, I don't know, like they were going to try to get some information from us, try and get us into the car, and that's why we kept walking." The police report states that the boys said the driver of the truck yelled out the window, "Hey kids, come over here, I want to talk to you." The Wisconsin Christian News reported that the police said the boys reported that the men were trying to abduct them, but later changed their story. The police report states that the boys claimed Pastor Dave addressed them twice; Pastor Dave says he only addressed them once, which doesn't matter either way. It is no more illegal to have addressed the boys twice, than once. 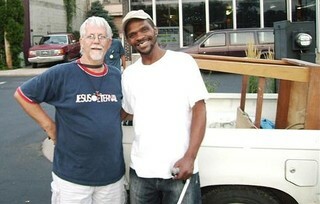 Pastor Dave who was a Beloit, Wisconsin Police Chaplain for twelve years is pictured here with Nathaniel Partee, standing next to the small Toyota pickup less than an hour before the arrests. The truck that the two men were in is a small Toyota. The cab fits only two people in it, hence it could not have been possible to abduct two teen boys in the vehicle. The first officer on the scene who was also the arresting officer (officer Blaser) states in the police report that upon entering the parking lot he saw the white truck pulling out. Officer Blaser also states in the report that the two men were sitting in a "small cab of a pickup next to each other." According to officer Blaser's report, his contact with the boys prior to his contact with Pastor Dave consisted of the boys pointing at the white pick-up truck, officer Blaser pointing at the white pick-up truck, officer Blaser asking the boys if that was it, and the boys saying "yes." –Hey, you just cannot make this stuff up. It's on page one of officer Blaser's report. After the two men had finished eating their sandwiches, they had headed out of the parking lot and down the road. Within three blocks the men were pulled over. According to the police report, Pastor Dave was questioned, arrested, patted down, arrested for resisting the first arrest, put into a "compliance hold" by two officers and then into hand-cuffs all within approximately four minutes of having been pulled over. The third officer on the scene states in the police report that he got there approximately four minutes after the arresting officer got there and saw officers Blaser and Johnson (the second officer on the scene) putting Pastor Dave into handcuffs. Officer Blaser's report confirms the two arrests, the patting down, the compliance hold, and the handcuffing. Pastor Dave said that he was arrested for disorderly conduct and for resisting. While speaking with Pastor Dave, he told me that he was not told until that next Monday why he was arrested for disorderly conduct. He was told that it was because he talked to the boys. He also said to me that he was not resisting, but that he was just asking why it was happening and that he was in shock by it all. In so many words, he said that he was treated badly. He also said that he almost fell over when he was leaning up against the truck, with his legs spread, being patted down, and the officer grabbed his hands to put him in handcuffs. He lost his footing. And he was very uncomfortable with the search that went in a place that is private. –The officer stated in the report that Pastor Dave jumped at that point. Officer Blaser has since claimed that he had not arrested Pastor Dave for disorderly conduct until after the teens had been questioned by the third officer on the scene, officer Katzenmeyer, the officer who showed up on the scene when Pastor Dave was being placed in handcuffs. Officer Johnson's report suggests such, as well. I suppose officer Blaser would be in big trouble if he had placed a man under arrest for disorderly conduct on the grounds of a pointing game and or the dispatcher's hearsay. However, according to officer Blaser's own words in the police report, he placed Pastor Dave under arrest for something before he placed him under arrest for resisting. On page four of his report, in giving the "probable cause" for "resisting an officer," officer Blaser states, "As I told him he was under arrest, he continually tried to pull his hands in front of him, thus resisting arrest. He knew he was being placed under arrest and knowingly resisted that arrest." Officer Johnson's statement even goes one step further by showing officer Blaser as having not arrested Pastor Dave for resisting until after officer Katzenmeyer had spoken with the teens, which took place well after Pastor Dave was put into handcuffs. Officer Blaser's report is very clear that he arrested Pastor Dave for resisting before Pastor Dave was put into handcuffs. Officer Johnson may want to rethink his statement. Later the second arrest, "resisting" was changed by the district attorney to "obstruction." Perhaps calling it obstruction is a way to seek to define the word "resisting" as meaning "resisting an officer from doing his duty" instead of what it clearly meant, "resisting an arrest," an arrest that came before talking to the accusers. I believe such would be called a "false arrest" in civil court. The police report speaks of two men having been suspects, a white man and a black man. Yet when pulled over, it appears that only the white man was treated as a suspect. Other than the color of their skin, the only immediate difference that could have been seen would have been that the white man had a shirt on that said, "Jesus is Eternal." Officer Blaser makes out in his report that he was very courteous and patient with Pastor Dave, only doing that, which he absolutely had to do, stating things like he had "advised" Pastor Dave that he "would like" to pat him down for weapons, and that at one point he was advising Pastor Dave that he was being as "polite" as he could be. He does this while he makes out that Pastor Dave was so uncooperative that it deemed all he did to Pastor Dave. Interestingly enough, after he finished with Pastor Dave, he simply questioned Mr. Partee and told him that he was not under arrest. Perhaps the officer was pooped out by that time, or perhaps he had no need to go after Mr. Partee. Officer Blaser's report claims that Pastor Dave was not "comfortable" answering his questions and that Pastor Dave was "evasive." Pastor Dave states that he did answer officer Blaser's questions. He said that he told officer Blaser that he had talked to two teens, that he just wanted to tell them about Jesus and to invite them to a concert that they were having. Pastor Dave said that he told this to officer Blaser right away when he had been asked if he had talked to anyone at Burger King. Pastor Dave's answers were supported by Nathaniel Partee's answers when he was questioned. And his answers were also supported by the fact that the weekend music event really did take place. Nathaniel also told officer Blaser that Pastor Dave was giving him a ride to the detox center, which also proved to be true. It was actually the third officer on the scene, officer Katezenmeyer that drove Mr. Partee the rest of the way to the detox center. The police had two extra IDs by which to identifiy Pastor Dave with, two besides his driver's license. They had his fishing license and his pastor membership card. However, officer Blaser's statement about the pocketknife that was found during a search of Pastor Dave's person was that it "could" be "considered" a "weapon." I suppose the obvious, that he had a preacher who liked to go fishing and used a pocket knife for when he caught something would have just not been as exciting as finding what "could" have been "considered" a "weapon!" Officer Blaser even went as far in the report as to make out that he felt that Pastor Dave was going to make a run for it. Yes, officer Blaser stated, "He was looking around as if he was looking for some place to go. The vehicle was still in gear and the ignition was still running." The truck was a standard, a four on the floor, with no markings on the stick shift that was in-between the two men. So, how on earth would the officer have known if it was in gear? Interestingly enough, the second officer on the scene, officer Johnson had the same vision; he also said that the vehicle was in gear. Oh, but this gets better. Six sentences later in the same paragraph, in the same report, the same arresting officer states, "I was concerned that he may put the vehicle in gear, as I had already asked him to step out of the vehicle to talk to him." One really does have to ask one's self why officer Blaser's report reads like a defense of officer Blaser. And one really should ask why when the dispatch went out as two men trying to coerce two teen males into a truck and the police report listed two men as suspects, why was just one man treated as such. Nathaniel Partee was never patted down. The second officer was helping the first officer with Pastor Dave while Nathaniel Partee was unattended. Why does it appear the two officers were not concerned about the passenger of the truck while they were both handling the driver? Up-Date: First Pastor David Fogderud was wrongly arrested and charged with "Disorderly Conduct" for having addressed to teenagers in a parking lot, as part of his ministry. Then he was wrongly arrested and charged with "Resisting" the first arrest. Later the district attorney changed the second charge from "Resisting" to "Obstruction." This is the short version. At one point in the case, the district attorney offered to drop the obstruction charge if Pastor Dave would have pleaded guilty to the disorderly conduct charge. That did not fly, as Pastor Dave was not about to plead guilty to such a horrendous charge. So, what did the district attorney do? Well, within a week of the trial she flipped it around. She dropped the disorderly conduct charge and went with the obstruction charge. I guess they get to pick and choose these things like candy in a candy store. And we wonder why so many people do not agree with the judicial system in this country. The district attorney obviously realized that in the United States of America, speaking to two teen boys did not constitute disorderly conduct. She admitted, in so many words, on April 27, 2009 during Pastor Dave's trial in her opening statement that he had not done anything wrong towards the teens. The obstruction trial, that in essence, turned out to be Pastor Dave on trial for his own arrest, came down to his word against three cops. Who do you think won? Keeping in mind the theatrics that can go on in such a trial, I don't think it is hard to figure out the answer to that question. I invite your continued prayer support. I have asked the Lord to help me portray a Christ-like attitude and show the Love of Jesus regarding those who have falsely accused me. I intend to look into the possibility of an Appeal but know that it cost more money and I still owe my attorney $1000. I would like to see justice done even though, by the Grace of God, I can handle opposition when my intentions were pure. Forgive me if I feel somewhat persecuted. I invite you to read with me from I Peter 4:12-16 and I will continue to tell people about Jesus and about how much He loves them. I will continue to have as my favorite verse Romans 1:16 which says that "I am NOT ashamed of the Gospel of Christ, for it is the power of God to salvation for everyone who believes, for the Jew first and also for the Greek." May God Bless You all! Any money left over will go towards this year's Rock On The Rock music festival. The Overflowing Cup started as a Coffeehouse on April 19, 1974, next to Domenico's Pizza at 534 East Grand Avenue in downtown Beloit. Since 1974 more than 1000 different groups have performed at The Overflowing Cup. 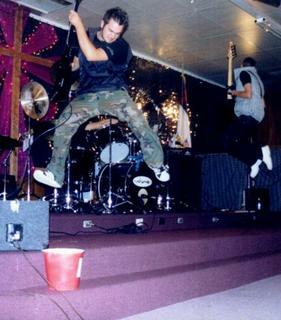 This includes local artists such as Jeff Coan, Tom Mathy, John Reints, The Richmond Brothers and a young Christian Rock Group called PROPHET. In addition to local artists, many nationally known artists played at The Overflowing Cup including Resurrection Band, REZ Band, Glenn Kaiser Blues Band, John Michael Talbot, GLAD, Servant, Soul Purpose, Randy Matthews (sometimes called the Grandfather of Christian Rock 'n Roll), Terry Talbot and MASON PROFIT, Bob Bennett, Saved By Grace, Randy Stonehill and many more.